Best burgers in Beverly? A&B is a real contender. On a night so cold you have to worry about frostbite, would-be patrons at A&B Burgers in Beverly are waiting 45 minutes for a table. The place has more than 120 seats, a big bar, a long high-topped communal table, and wide garage doors in front. A&B had a year-and-a-half run in the Old Salem Jail (poor parking and no street visibility) and has been in the former Bell Market building in Beverly since early January. The menu has 11 burgers, including beef, turkey, and crab-cake patties, many remarkable. All come with long, slender sea-salt fries — which are excellent when they’re hot, and crisp even when they’re not (they have a light potato-starch coating) — or sweet-potato fries (with a brown-sugar coating), which somehow always arrive hot. Both have the kind of addictive quality that McDonald’s fries had in their glory days, when potatoes were fried in beef tallow. 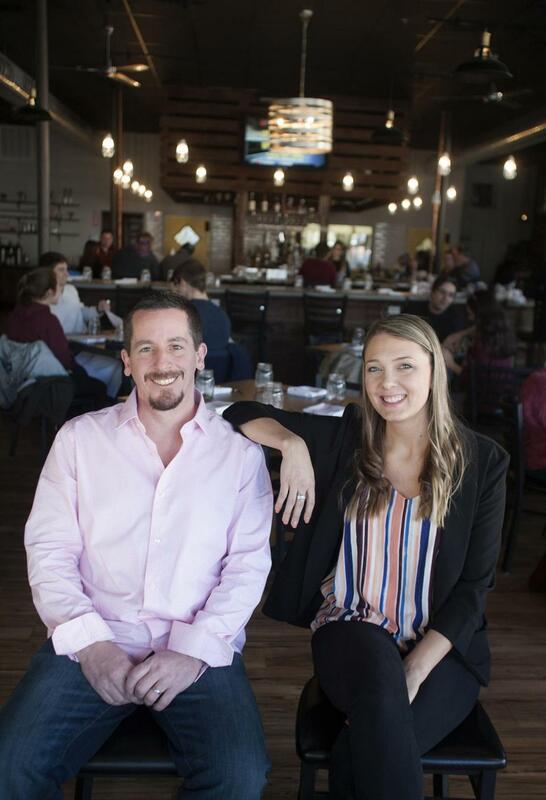 A&B’s regular fries are made from potatoes grown in Maine, cut off premises, and cooked in canola oil, says co-owner Thomas Holland, 45, a former general manager of Back Bay’s Sonsie and former Michael Schlow partner in Tico. Holland was also director of operations for Alta Strada at MGM Foxwoods. That might explain the smooth operation at A&B, named for Holland’s sons, Alex, 3, and Benjamin, 6. From the door to the bar, the staff seems to be well trained. And even when there are glitches — a bartender cannot locate a spoon, or a lunch table is ignored for 15 minutes in a half-full dining room — you go away feeling well looked after. Burgers are a cross between precious upscale patties made by chefs who want to prove they can do burgers as well as, say, cassoulet, and those at joints pushing out these classic favorites as quickly as they can. A&B’s hormone-free Angus beef, from Pineland Farms in New Gloucester, Maine, is griddled but never pressed. Think of them as slow burgers, and you do wait for a 7½-ounce patty that consistently arrives caramelized outside, juicy inside, cooked to the doneness you requested. It’s more than an inch thick, on a lightly toasted brioche bun from Malden’s Piantedosi Baking Co. The A burger ($11) has American cheese, arugula, and house sauce; the B burger ($12) adds bacon; the sweet and salty ($13) tucks in burrata cheese, fig jam, and bacon. The Greek turkey burger ($11) is surprisingly juicy; feta cheese and tzatziki sauce are in the stack. The jumbo crab cake burger ($15) is a filler-filled crab cake with mustard aioli and salad vegetables. One graceless moment: DIY doggie bags. You’re handed a container to take something home. Co-owners Thomas Holland and Amy Butler Constant. On the salad menu, one with candied butternut squash, pine nuts, and goat cheese ($10) has a wonderful Dijon vinaigrette. The Southwestern ($11) combines chopped romaine, bacon, grilled corn, blue cheese, and avocado with ranch dressing. The Caesar’s romaine ($8) is also chopped (enough chopping! ), with large croutons and an anchovy if you look hard. The delicious dressing deserves better. Pan-roasted Brussels sprouts ($9) with bacon and a sherry reduction have all the right flavors, but the sprouts are hard. 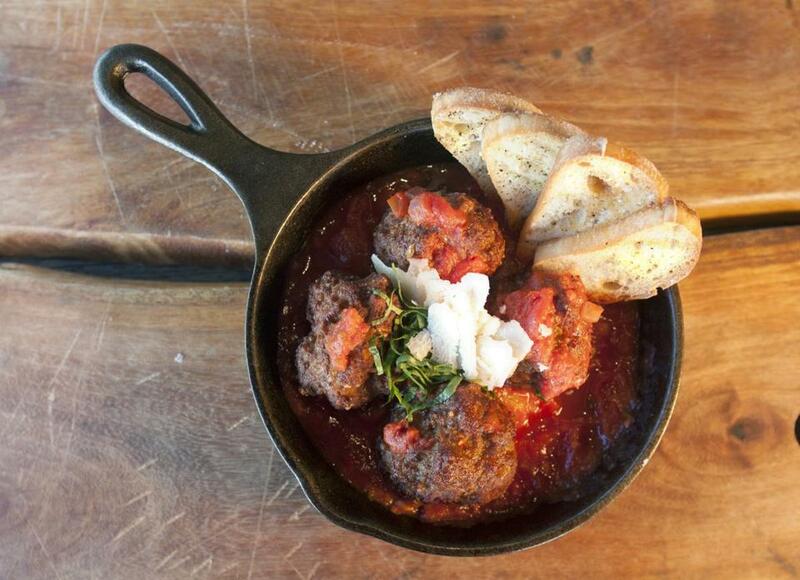 Delightfully chewy, moist veal meatballs ($9) in a bright but intense, chunky pomodoro sauce are delicious. Lunch offers sandwiches, such as fried eggplant ($10), crisp rounds in a dull presentation, and Moody’s Delicatessen pastrami with Tabasco slaw on toasted marble rye ($12), one of the best items on the menu. Entrees like grilled salmon ($23), pan-roasted chicken breast ($18), and chicken and waffles ($15) seem superfluous, but Holland says he’s offering what customers want. Stellar milkshakes ($5 regular, $10 with alcohol) are thick with Treadwell’s ice cream from Peabody. One frosty night a chocolate, sea salt, bourbon shake is a perfect dessert. But the regular chocolate after lunch one day is just as irresistible. Amy Butler Constant, 27, is co-owner with Holland. The two met when she was in the marketing program at Johnson & Wales and he hired her as a waitress at a restaurant he was running. 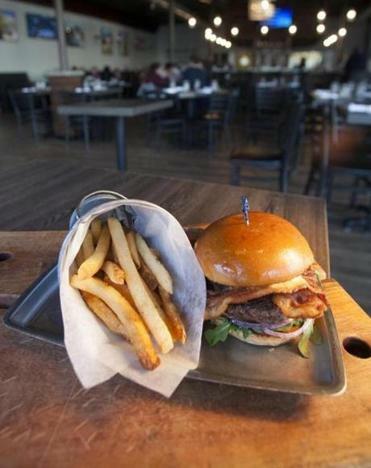 They opened a big, roomy urban barn with exposed pipes and modern lighting, offering a menu of well-raised, well-made burgers. It’s always a delight when the place meets the plan. 206 Cabot St., Beverly, 978-993-7394, www.anbburgers.com. All major credit cards. Wheelchair accessible. Prices Small plates and salads $3-$13. 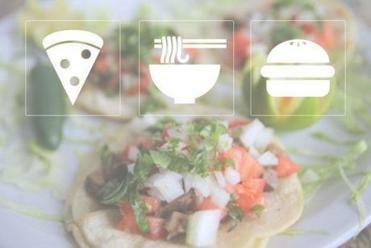 Entrees $18-$28 (most under $20). Burgers $9-$13. Milkshakes (nonalcoholic and adult) $5 and $10. Hours Sun-Thu 11:30-1 a.m. (full menu until 10 p.m., burgers until midnight). What to order Veal meatballs, butternut squash salad, Southwestern salad, pastrami sandwich (on lunch menu), A burger, B burger, Greek turkey burger, sweet and salty burger.